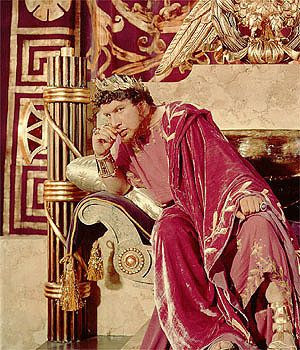 Today, I'm writing about Peter Ustinov's Academy Award-nominated performance as Roman Emperor Nero in Quo Vadis (1951). This article is part of The Great Villain Blogathon 2017 hosted by Speakeasy, Shadows and Satin, and Silver Screenings. Every old Hollywood epic needs a memorable villain, whether it's the arrogant Rameses (Yul Brynner) in The Ten Commandments (1956) or the vindictive Messala (Stephen Boyd) in Ben-Hur (1959). A Biblical baddie for our time is Peter Ustinov as the depraved Roman Emperor Nero in the 1951 version of Quo Vadis. Quo Vadis is based on Polish Nobel Laureate Henryk Sienkiewicz's 1895 novel (the title, which means "where are you going" in Latin, is based on a question that, according to Catholic tradition, Peter asked Jesus Christ). Quo Vadis takes place in first-century Rome and deals with the lives of early Christians, who were a persecuted minority group at the time. The primary characters are Roman commander Marcus Vinicius (Robert Taylor) who falls in love with beautiful Christian Lygia (Deborah Kerr) after returning from a successful military campaign on the empire's Western border. Together the couple live through several tumultuous events, including the burning of Rome and Nero's vicious persecution of the early Christians. Although Marcus and Lygia are fictional characters, both Sienkiewicz's novel and the MGM adaptation surround them with several historical people, including the Apostle Peter (played by Finlay Currie, old Hollywood's go-to actor for saintly old gents), the Roman noble Petronius (Leo Genn), and, most memorably of all, Nero, whom Ustinov plays as the ultimate self-indulgent man-child. In many ways, Ustinov's florid performance as Nero is the showpiece of the movie, but the original conception for the character was far different from what appears in the final film. 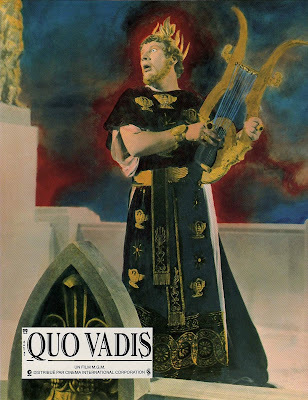 Quo Vadis was one of MGM's longest-gestating projects; it was first greenlit in the 1930's with Wallace Beery slated to play Nero as a first-century facsimile of Italian dictator Benito Mussolini. The fascist leader fancied himself a new kind of Roman emperor, and he even had extensive plans for rebuilding Rome that were modeled on the style of ancient Rome (there's more on that here). 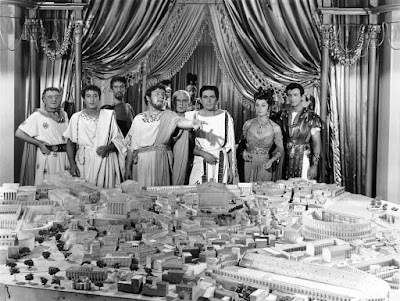 In fact, Nero's elaborate architectural model (photo below) for the rebuilt Rome actually belonged to Mussolini; MGM borrowed it from the Italian government for the film. 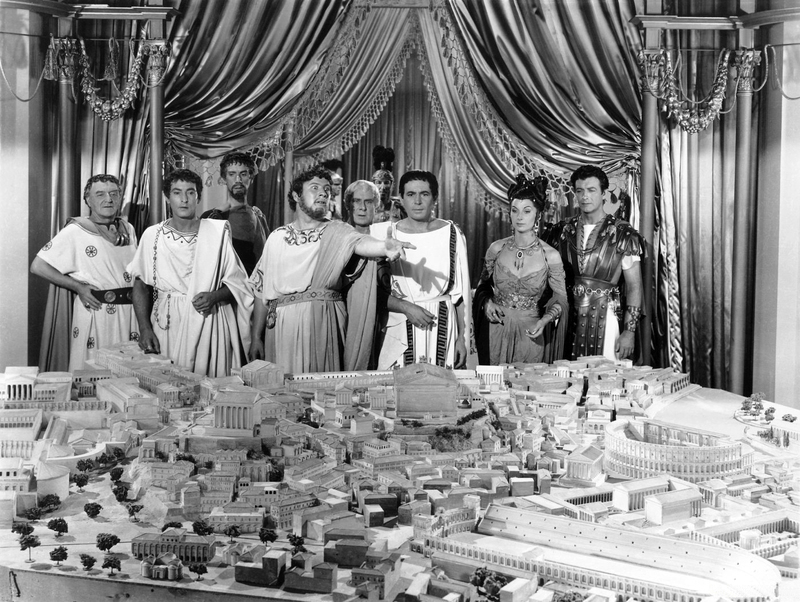 Nero (Peter Ustinov pointing at center) unveils his vision for a new Rome to astonished onlookers in Quo Vadis (1951). The model city used in this scene once belonged to Italian dictator Benito Mussolini. MGM put the project on hold because of World War II, and by the time Ustinov landed the role in 1951, director Mervyn LeRoy had a completely different conception for the character. According to Ustinov's autobiography, "Dear Me," the veteran director urged Ustinov to play the character as an emotionally stunted man-child whose juvenile antics make him completely unfit to rule over half the world's population (The real Nero probably didn't play the lyre while Rome burned, but, if anything, Quo Vadis undersells the brutality of a man who once disemboweled his pregnant wife). At first, Nero comes off as a comic character in Quo Vadis. He forces his put-upon advisers to spend hours listening to him bellow terrible songs on the lyre, he behaves like an angry toddler when he is asked to perform even basic duties, and he shrieks like he is having a limb amputated while receiving a pedicure. But as the movie unfolds, Nero's absolute power over his subjects -- he is viewed by the Romans as a god on earth -- becomes increasingly chilling. Nero's constant need for flattery means that he is surrounded by a group of sycophantic advisers who endlessly grift off of him, the worst of which is his trophy wife, Poppaea (Patricia Laffan). He has a total disregard for human life -- he casually metes out death sentences while noshing on a roast chicken -- and, when his brutality becomes unpopular, he scapegoats an entire minority group to maintain his tenuous hold on power. Sadly, dictators and would-be dictators haven't changed that much in 2,000 years, but very few have gone about their evil ways with quite the same flair as Nero. I'll leave you with Ustinov's hilarious rendering of one of Nero's "compositions." Quo Vadis is available on DVD, Blu-ray and video on demand. Since reading your post, I've spent the past half hour looking up Peter Ustinov/Quo Vadis clips on YouTube. Is it just me, or does Ustinov seem to have a little too much fun in some of these scenes? Ustinov's Nero is amusing in some scenes and pathetic in others, but we're always keenly aware of the terrifying power he wields. This unstable kind of dictator is a nightmare – which so many people have experienced in real life throughout history. 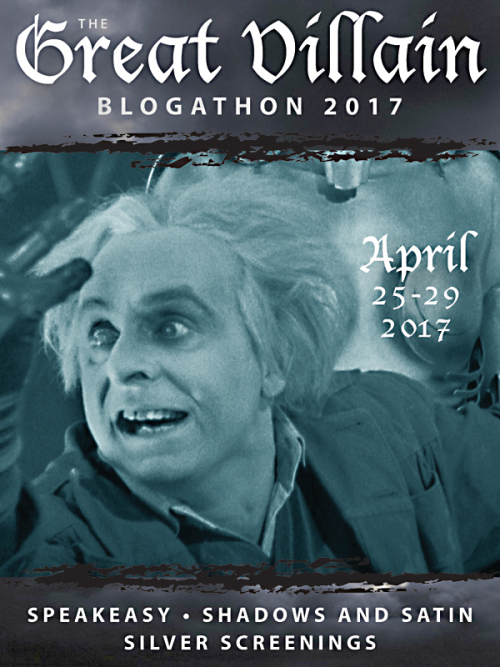 Thank you for joining the blogathon and for bringing Quo Vadis with you. Great choice! Yes, Ustinov is enjoying hamming it up. I will admit to DVD surfing through Quo Vadis just for the Nero scenes. The depths of Nero's depravity is genuinely creepy and frightening when watching Quo Vadis. 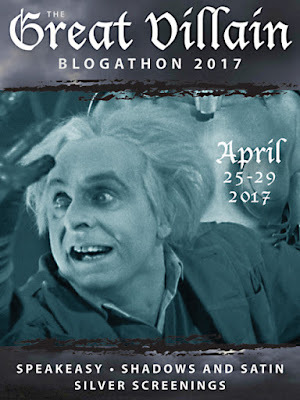 I wouldn't have thought about the character for this blogathon, but after reading your article I doubt I'll be thinking of much else for quite a while. I checked out a bio from the library about the real Nero, and his exploits will, as my Grandpa used to say, curl your hair. One of my guilty pleasures too. Although Ustinov was more than capable of restrained performances, I love him when he is hamming it up. Very interesting choice of villain. I probably wouldn't have thought of Nero because he is a historical character who really was a villain. Crazy logic, but he is all over the place. At times he's comical, cruel, and pitiable. Good job overall. I enjoyed reading your post. Maybe next year you can do Caligula from "The Robe!" Great post! I love Peter Ustinov. He was great in everything. THanks for sharing at The Classic Movie Marathon Link Party. I appreciate it.